The moon Dione is the fourth out of Saturn's large inner moons and the fifteenth largest in the solar system, with a diameter of 697 miles. It lies 234,503 miles from its host planet, which it orbits in 2.74 days. 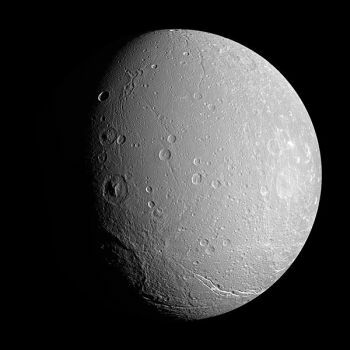 Although, like the other large inner moons, Dione is composed primarily of water ice, it is substantially more dense than its neighbours, leading to the supposition that it also has large amounts of silicate rock in its interior. Dione's surface displays two very different characteristics, which we'll explore here. Dione has many craters and the moon features three different types of area: heavily cratered, cratered plains and lightly cratered plains. The trailing hemisphere is more heavily cratered than the leading one, which, according to astronomers, is the wrong way round. They surmised from this that the moon must have been constantly spun on its axis by impacts (it's small enough for this to happen). The heavily cratered area has craters in excess of 62 miles diameter, while those in the cratered plains are no more than 19. All craters are degraded, meaning the water ice of the surface has yielded over time to allow them to fade into their surroundings. 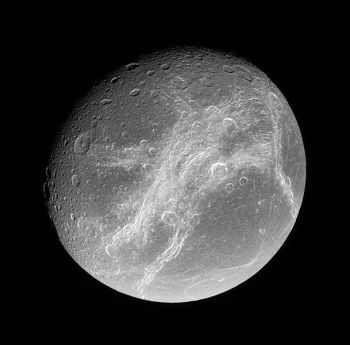 In 1980, the Voyager probe photographed an unusual phenomenon on the moon Dione. 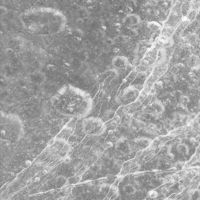 The whole of its trailing hemisphere appeared to be covered with large wispy features, initially christened the "wispy terrain". At first, it was puzzling as to what these features actually were and scientists put forward various theories to explain them. The problem was solved with a Cassini flyby in 2004, which imaged these things in close up. They were revealed to be gigantic ice cliffs created by fractures in the moon's icy surface. A subsequent closer flyby from Cassini was able to image them from a different angle, showing that some of these cliffs are around 200 miles high. Does Dione Have an Atmosphere? The Cassini probe comes into its own once again. In 2010, it detected a thin layer of molecular oxygen around the moon. However, it is so extremely tenuous that scientists refuse to call it an actual "atmosphere", preferring the term "exosphere".